It’s easy to feel stuck in the past or burdened with regrets – but it’s not necessary. 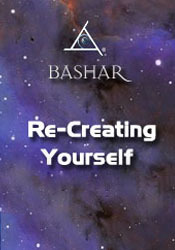 In this vintage session Bashar goes over some of the physics of consciousness, how and why we often misperceive time, and how we may redefine our understanding of time to good advantage. Bashar has said many times that every change is a total change. In this transmission he describes how we may use the painful parts of our histories in a positive way, or potentially shift such that a certain negative experience never occurred within our new past. We can open up our range of choices for our life experience in the now and feel more free and present in our moment. This is an excellent talk on parallel realities from the perspective of using them to change what is not preferred in our lives based on what we perceive as the past. I woke up the other day with a deep scratch on my left arm near the elbow. Was I abducted, or was it something I did to myself? When you’re given a mantra in Transcendental Meditation, is that something that that my higher self or my guides are helping to choose, or is it something that any individual can pick for themselves? If somebody didn’t want to go through formal training they just picked their own mantra, would it be equally effective for that person? I think you said Arcturus was a gateway to Essasani, Sirius, and Earth. Can you refresh my memory? I had a vision of me teaching a group of hybrid children. Is that a vision that’s happening right now or in the future? Can you give me a rough age range of these children? Are my own children involved? I had a dream that I was on an examination table like I was told that everything is in perfect working order. Can you explain? Can you talk about an important date galactically coming up on the fifteenth of February. I asked you before about my hybrid child, Violet, if you would tell me what her birth date was and you said not at that time. How about tonight? Is my tooth as sick as I think it is? In your monologue you mentioned the one light. Where did it come from? What is the difference between consciousness and awareness? What is the Prime Radiant? Are Sassanis a kind of Greys? Are you a hybrid? Why do I get so nervous every time I talk to you? Why do I keep thinking I’m going to be cut? What is the spiritual lesson for me in the fact that my cat keeps killing things? Why did my rescue cat leave me? I hear a cat crying outside, but he will be destructive if I bring him in. What should I do? Are the men in black real? Should I be afraid of them? Is it possible that our perceptions of our alien encounters are manipulated? What do the 33rd-degree Masons think they know that they think we don’t know? Have I had Reptilian and Grey contact? There’s a man called Major Ed Dames who is prophesying a lot of disasters in the future. Is he tapping into the collective consciousness? What type of forms can we see in a physical reality that’s reflective of the Sirius energy or the sixth-density energy? Is there a form that maybe we see or take for granted that is actually a Sirius energy? Is Sirius a water-based civilization? Does the Age of Aquarius connect to the Age of Sirius energy? Is that symbolically the same thing? Are there any crafts that when they take off, they shed a portion of their craft like we do our spacecrafts when the rockets take off? I had a nightmare about space craft. What does it mean? I’m experiencing things slipping in and out of reality. Is this real? Can I access Monet’s influence through the collective unconscious? I’ve discovered when I make my lower jaw go forward, I hear a high frequency sound. Can you give me more information about a book called The Hathor Material? What is the relationship between the sacred alphabet, energy, and sound? I’ve been having headaches that feel like my brain is too large for my skull. What’s going on? There are a lot of warring factions in the autism discussion. What are your thoughts? My child seems to be gifted in architecture and spatial dimension. Is he tapping into the template-level reality? My daughter has nightmares and wakes up with vaginal pain. It’s bringing up my own childhood abuse issues. Any advice?